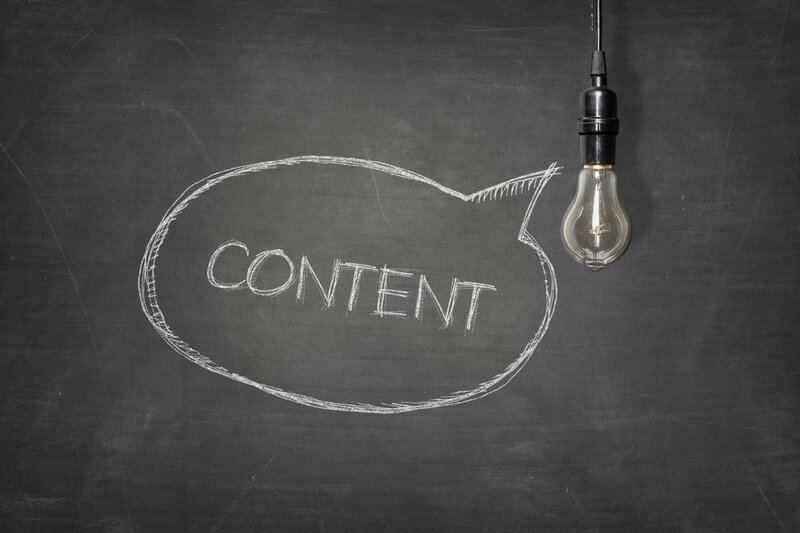 I believe a great example of being helpful through content is the FAQ. Yes, the pre-Web textual tradition that sought to reduce answering tedious questions posted on mailing lists and online forums by listing commonly asked questions and providing answers. We all want answers to our questions, right? And in this digital world it’s not hard to identify those questions and answer them. So with FAQ’s so helpful, why is it so easy to screw it up? Too many take on a sales approach with their FAQ, and as a result, FAQ’s became sketchy, listing questions regardless of whether or not the questions are frequently asked or even if they are asked at all. So here’s how to do it right. First, determine the actual questions your audience is asking—both offline and online. Second, answer those questions honestly. Third, make sure the answers are findable and shareable. I recently came across two companies that do a great job with their FAQs. 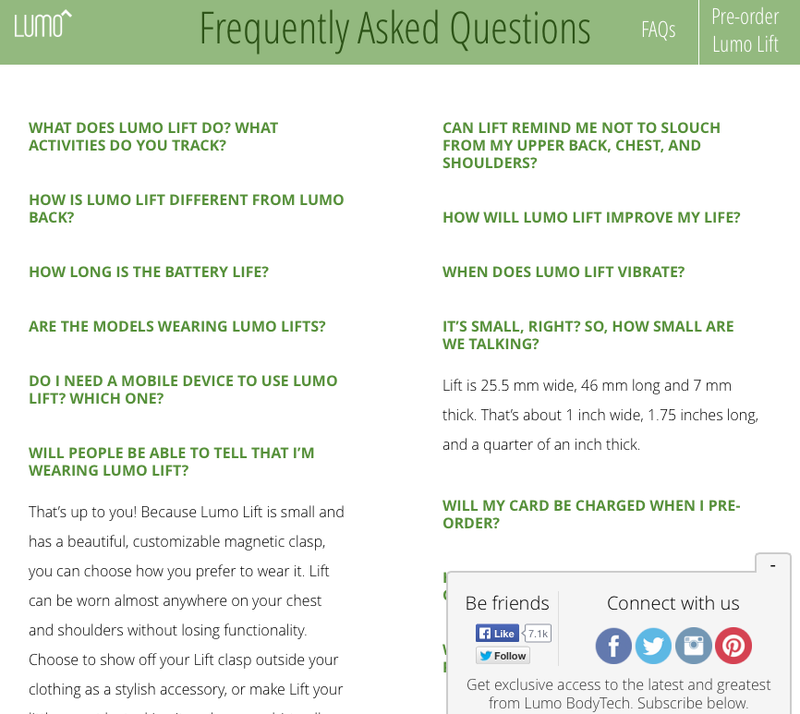 Lumo, a wearable tech company for back health, asks questions as if they were asking a friend: “It’s small, right? So, how small are we talking?” is a sample question. Another question relative to a shipping information detail is obviously born out of some customer service insight. And lastly, their FAQ is easy to find right on the top nav. Finsync, a provider of cloud-based account and financial management tools, has a FAQ that is not as easy to find (in the bottom nav) but provides an answer to one of the most compelling frequently asked question: “Who can I compare you to?” Most companies wouldn’t dare to list competitive alternatives. 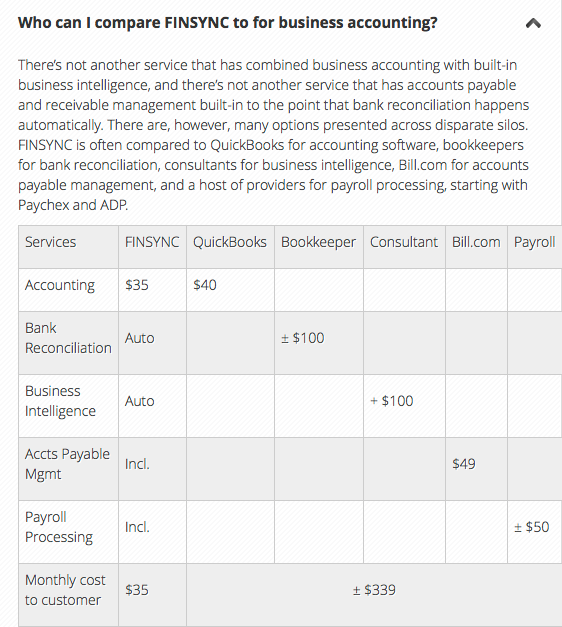 Finsync does this boldly, stacking their services up against their competitors’ in an easy-to-read comparison chart. Kudos to both companies for being so helpful. Got any others to add to this list? I’d love to check them out.